In the waning moments of a downright rollicking 67-65 triple-overtime win over Illlinois, Michigan QB Tate Forcier was forced out of bounds and into WXYZ Sports Director Don Shane's eternal soul. Don suffered a split lip that required stitches and he hit his head on the ground as he fell. 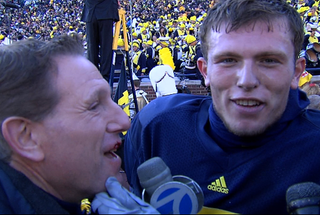 He was cared for by Michigan's medical staff after the game. He went through a series of concussion tests and received four stitches in his upper lip.